Costa Rica is a top world travel destination. 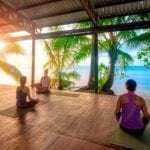 Costa Rica is a top world travel destination because it has something for everyone: tropical rainforest, green mountains, spectacular beaches, active volcanoes, wild rivers and lakes, and charming towns. 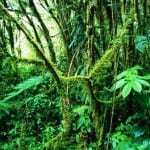 The dry tropical forest and wide savannas of the north Pacific are as varied as the dense, steamy jungle of the south Pacific, the misty cool cloud forest high in the central mountains, and the distinctive character and culture of the Caribbean Coast as compared to the Pacific. Here is our list of the top 10 travel destinations in Costa Rica. We’re sure you’ll find something just right for your next vacation! 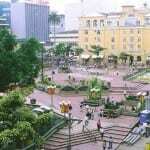 Costa Rica’s capital city of San José is where most visitors begin their Costa Rica vacation. Located near the Juan Santamaria International Airport, San José is full of interesting museums, theatres, parks and historical buildings. In the surrounding Central Valley, you have the Poás and Irazú volcanoes and national parks, coffee plantation tours, the artisan town of Sarchi, and butterfly and botanical gardens. 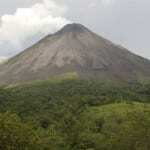 The Arenal Volcano is one of the most visited areas in Costa Rica. People come to see one of the world’s most active volcanoes, and to experience its natural volcanic hot springs, and the lush rainforest and lava flows of the Arenal Volcano National Park. Most hotels and activities are near the small town of La Fortuna, around the base of the Arenal Volcano and by Lake Arenal – a world destination for windsurfing. Adventure activities abound here: canopy zipline tours, aerial trams hanging bridges, whitewater rafting, hiking, waterfall canyoning, kayaking and fishing on the lake, and horseback riding. Monteverde means “green mountain” in Spanish, and is an apt name for the emerald green, misty cloud forest in the central mountains. Considered a premiere ecotourism destination, Newsweek named it 14th of the “100 places to remember before they disappear.” National Geographic calls Monteverde the “the jewel in the crown of cloud forest reserves.” The region’s variable climate and high altitude has produced an extremely high level of biodiversity, and it is considered one of Costa Rica’s Seven Wonders. 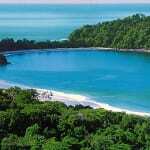 On the Central Pacific Coast, Manuel Antonio is a must see on anyone’s Costa Rica vacation. Lush rainforest spills down high coastal bluffs to turquoise seas, isolated coves and sparkling white sand beaches. 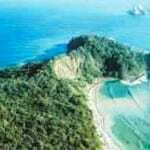 The Manuel Antonio National Park gets top marks for its excellent wildlife viewing. Lodging ranges from posh luxury to simple beach cabanas. Adventure tours are abundant: scuba diving, snorkeling, sea kayaking, sailing, whale and dolphin-watching tours, hiking, canopy ziplines, waterfall rappelling, whitewater rafting, mountain biking, and horseback riding. 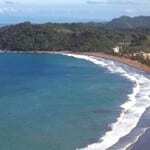 Just north of Manuel Antonio, Jacó Beach is the closest big beach town to the capital city. The area is popular for surfing, with many national and international surfing competitions held here. The wide sandy beach is great for walking, and there are many adventure and nature tours, hotels, restaurants, shops and nightlife. 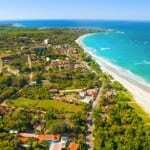 On the north Pacific Guanacaste “Gold Coast”, Tamarindo Beach is a tourist hotspot. It has all the amenities of a fun Costa Rica beach town – great surf, sand, sun and a bustling nightlife. The town is well-developed with hotels, restaurants, spas, shops and galleries, medical facilities and world-class golf courses. Across an estuary to the north lies Playa Grande, where Leatherback Turtles come to lay their eggs. Puerto Viejo and Cahuita are laidback southern Caribbean beach towns with a unique blend of Latin, Afro-Caribbean, and cosmopolitan cultures. The region is popular with surfers, eco-tourists and beach lovers. Don’t miss the Manzanillo Wildlife Refuge and Cahuita National Park. 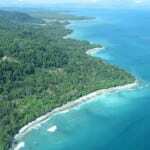 The tranquil seaside village of Drake Bay on the Osa Peninsula offers easy access to the Corcovado National Park – renowned for its natural beauty, diverse wildlife and unique ecology. 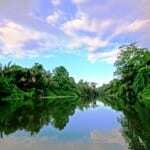 The Cano Island biological reserve and the Sierpe River mangrove estuary also are easily visited from here. 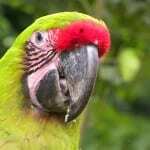 Known as “Costa Rica’s little Amazon” for its extensive network of natural and man-made waterways and lowland tropical jungle, Tortuguero on the Caribbean Coast is the habitat for half of all the bird and reptile species found in Costa Rica, and also the endangered West Indian Manatee. Tortuguero also is one of the most important nesting sites in the world for sea turtles. At the tip of the Nicoya Peninsula, the beach town of Montezuma – once a remote fishing village – is now a bohemian enclave for international artists and hippies. 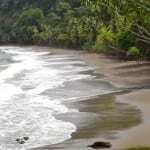 Eco-tourism is strong for Montezuma’s stunning beaches, rivers and scenic waterfalls that surround the village. 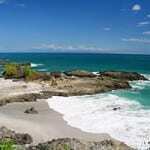 The nearby Cabo Blanco Nature Reserve also attracts a great number of visitors. Book your travel with Costa Rica travel agency, Costa Rica Guides. They specialize in Costa Rica vacation packages and Costa Rica information.